Should coffeeshops just ditch outlets and wifi? I am fortunate enough to work from home frequently, but if I stay in my actual house all day, I can easily get distracted by unfolded laundry and dirty dishes. So I have cased my neighborhood selection of cafés and coffeeshops. Starbucks gives me free wifi and high-octane coffee, but can get kind of crowded and noisy. Another neighborhoody place will give me a wifi code, but the router has the tendency to go in and out. One café has lovely seating and high-end snacks, but is super-expensive ($4 for a slice of lemon cake). Depending on my deadline, my budget, and my mood, I traverse around from place to place, searching for the perfect coffee-fueled remote workplace. Turns out, I am far from alone. The New York Times posted an interesting essay this week on the plight of today’s café owner, plagued by jerks like myself. For some, a bunch of anti-social ear-budded people is not what they envisioned when they created their European-esque conversation-friendly cafés. Others are grateful for the customers, but find to hard to break even when all these ingrates order is a $2 cup of coffee over several hours. The establishments’ responses to these remote workers range from subtle (reducing availability to electrical outlets, which will make laptoppers leave eventually) to not (signs that announce “No Computers”). Some coffeeshops just pulled their wifi outright. Still, these remote workers can be tenacious; one café owner reports a user ripping a piece of wallpaper right off the wall to reveal the outlet hidden underneath. As part of the problem (and as someone who spends approximate 47 percent of their waking hours looking for electrical outlets), I can see both sides. While the public library is right down the street, I can’t bring my high-octane thermos in there. I would greatly miss my remote workplace locations with the superior coffee and breakfast hash (thank you, Baker Miller), and would be willing to pay more to get to stay there. 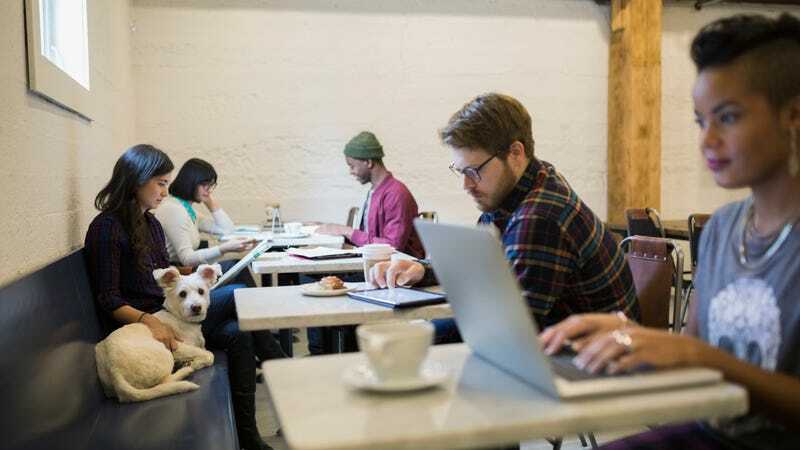 Maybe a café could bill itself as more of a shared workspace, offering a flat daily fee, but letting people stay as long as they wish, with a multitude of sweet, sweet, outlets. Or maybe I should just work at home more? After all, those dishes aren’t going to wash themselves, are they. You can read more about this ongoing debate at The New York Times today.